Poor Flavia is at it again! Not only does she discover some injured and dead people near her family home Buckshaw, but her sisters are still torturing her. Quite a full and exciting life for an 11 year old. 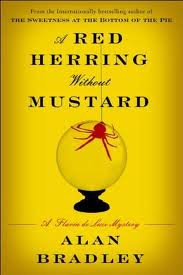 The child chemistry prodigy Flavia de Luce makes her third appearance in A Red Herring Without Mustard by Alan Bradley. This novel begins with Flavia, not unexpectedly, having her fortune told in a gypsy's tent at a local fair. When the gypsy tells her something that seems to come from her long-dead mother, Flavia jumps to her feet, upsetting a candle and setting the tent on fire. Feeling guilty about destroying the gypsy's property, Flavia invites the gypsy, Fenella Faa, to camp on her family's land. Checking on Fenella later, Flavia is horrified to find her severely beaten. This is just the first in a series of strange events. Eventually a dead body turns up impaled on a fountain at her family's estate. As usual, it's up to Flavia to put the pieces together (ably assisted again by her loyal sidekick, her bicycle Gladys) and solve the crime. The police, not surprisingly, are not keen to involve her in their investigations, nor to listen to any of her theories. In the meantime, her odious sisters Daffy and Feely spend a lot of time thinking of ways to torment Flavia. In addition to her sleuthing, Flavia also faces the first realization that all is not well with her father's finances. I greatly enjoy the time spent with Flavia, although I'm always a bit puzzled as to why neither she nor her sisters ever seem to go to school. I guess maybe the 3 books all take place in the summertime? There's never any mention of schooling, though, so it remains a mystery!